After visiting Monaco yesterday, we decided to explore Nice today and learn for ourselves what's so nice about Nice. Our search began in the old city, Vieux Nice, where we stumbled upon the outdoor markets along the Cours Saleya. Stalls were filled with flowers of myriad hues and shapes, arranged in artful bouquets or not. Spices and herbs tempted us with their tantalizing smells. 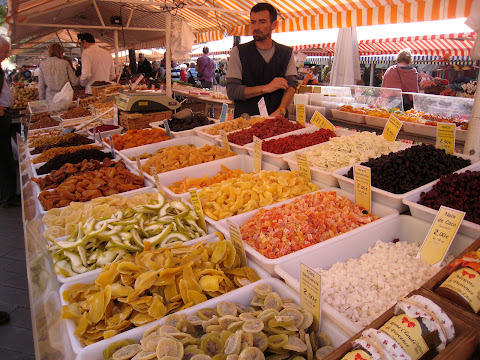 Fruits of every type were available-- fresh, candied, or dried. Vegetables, original watercolor paintings, nuts and seeds, olives-- the market was filled with seasonal fare and specialties of the Mediterranean and the south of France. It's held every day except Monday in a large square lined with cafes and bistros, where you can sit, sip, snack and survey the market. Leaving the market, we visited Nice's beautiful war memorial, Le Monument aux Morts. 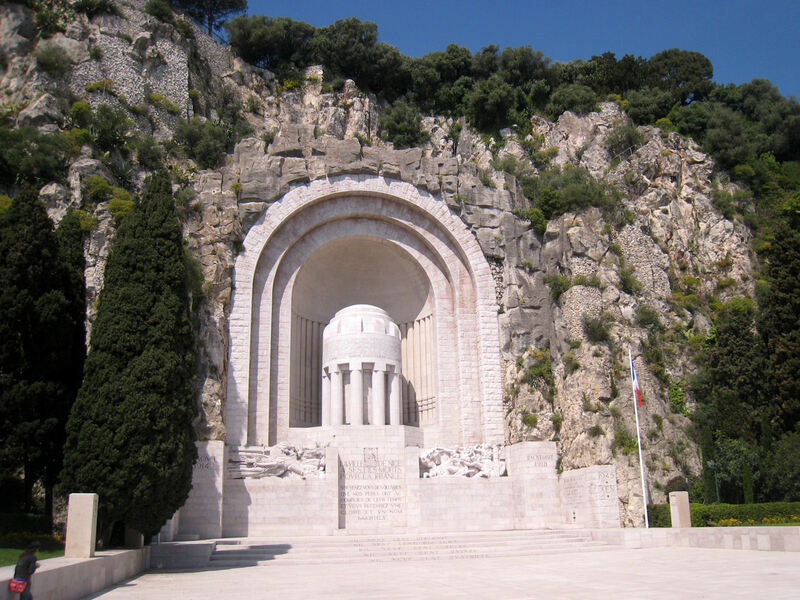 Set into the rock on the side of Castle Hill, the monument honors Niçois (nee-swa)-- natives of Nice-- who have died in military service to France. Designers ensured that this stately 105-foot tribute blends harmoniously with its setting. At the dedication service in 1928, families of World War I casualties placed the dog tags of their loved ones in a container which was sealed in the large urn at the center of the monument. Near the heart of the city, but away from busy thoroughfares, Le Monument aux Morts inspires silence and contemplation over the tragic loss of those it venerates. 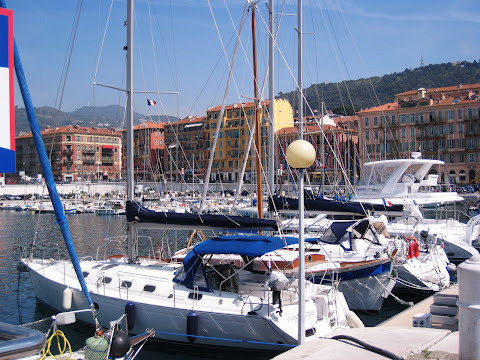 From this special spot, it was a short walk to the port of Nice, host to many pleasure craft and a handful of fishing vessels. Some commercial shipping is done here also, as well as ferry service to the nearby island of Corsica. In addition to the rows of sailboats, numerous large yachts were resident in the harbor. One of these was the Lady Christine, owned by a Scottish billionaire who makes his home in nearby Monaco. At 185 feet in length with a 33-foot beam, this mega yacht dwarfed the autos that were parked nearby. With five total cabins, the Lady Christine will accommodate up to 10 guests in high style. She is now on the market since her owner ran into some personal problems. If you have $40 million you'd like to get rid of, check her out here. When no one invited us to board the Lady, we decided to climb Castle Hill. Overlooking modern Nice, this hill was the site of the 3rd century BC Greek settlement here named for their god of victory, Nike. Today the hill constitutes Nice's premier city park. From the top, we had a panoramic overview of the city. Constructed in the late 1800s, a large man-made waterfall sits at the top of the hill, visible from the city below. 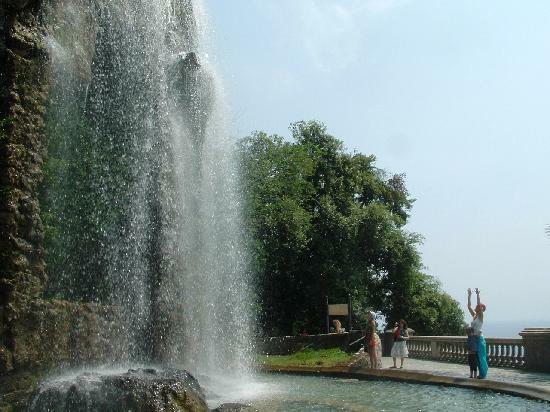 Unfortunately for us, the waterfall was undergoing some renovation and repair and was not working while we visited. Back down in the city, we came across one of the new Auto-Bleue stations which opened in Nice yesterday. 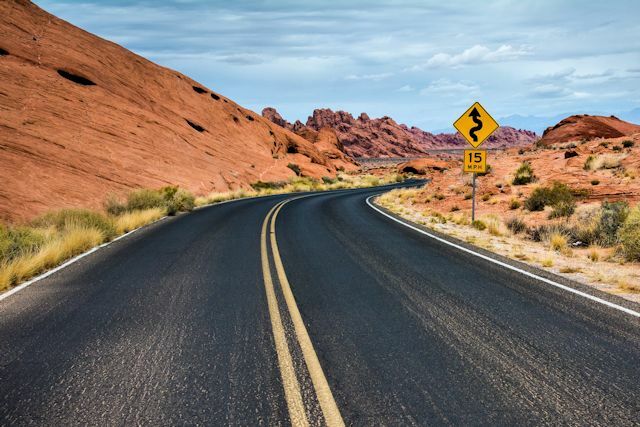 This new car-sharing program is designed to reduce consumption of fossil fuels and cut down on noise and air pollution. 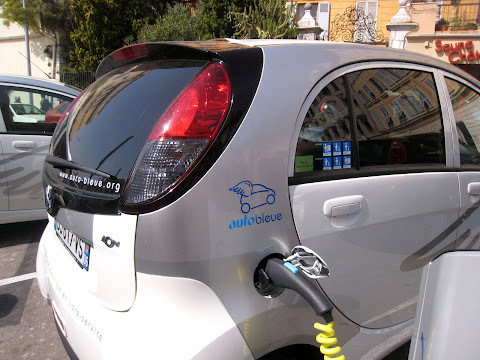 Using a telephone or the internet, residents and visitors can rent the all-electric cars by the hour or the day. Subscriptions are offered for frequent users. The French government is a partner in this environmental project. Seventeen stations with up to five cars each have opened in the Nice area, and the total number of stations is expected to be 70. Similar rental stations are already in use for bicycle sharing. No walk in Nice would be complete without a stroll along the Promenade des Anglais, and that's where we finished our journey. In the late 1700s when wealthy English visitors spent their winters in Nice, some of them contributed the construction of a walkway along the sea. The promenade runs for four miles from the airport to the foot of Castle Hill and is very popular with both tourists and residents. 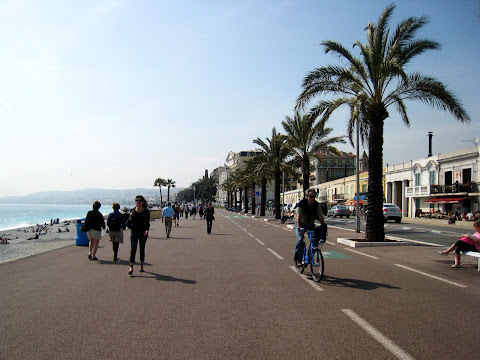 In summer, the walkway (la prom, as locals refer to it) is thick with sun lovers of all types. Unlike the sandy beaches on the Gulf of Mexico, the Nice beach along the promenade is covered in small gray stones, worn smooth by the sea. Ideally situated on the Mediterranean Sea, Nice is believed to be one of the oldest human settlements in the world. Evidence of flints and house construction in the area extend back many thousands of years. 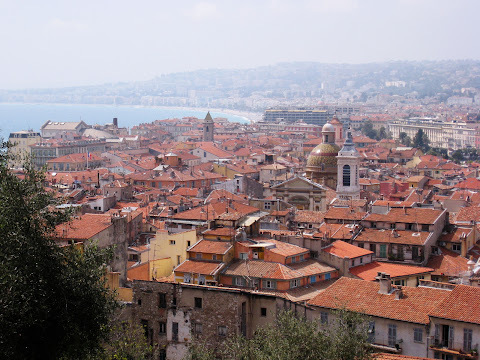 Though we missed some of Nice's other offerings like the Chagall and Matisse museums today, we were intrigued by the variety and history of this alluring seaside city. 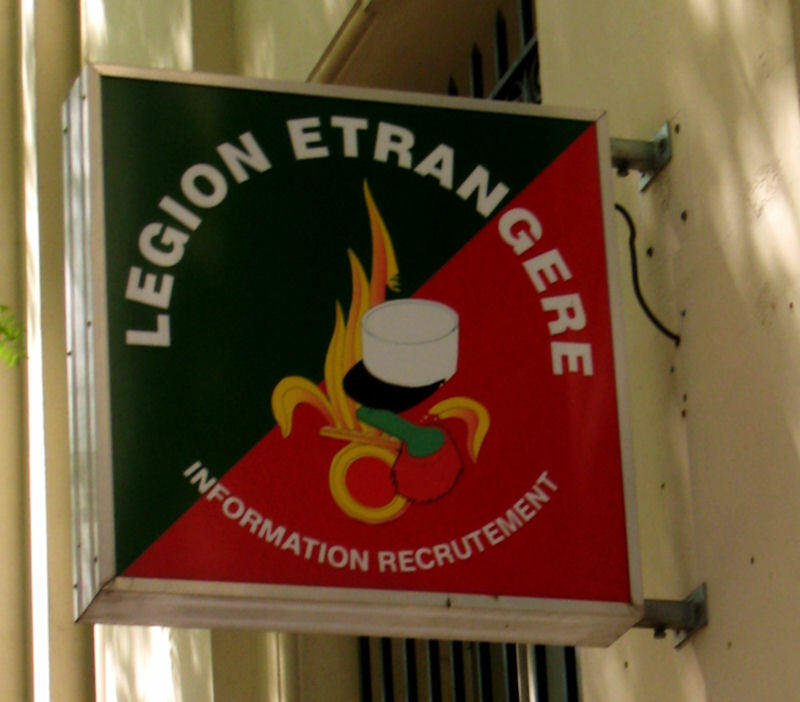 The French Foreign Legion was established in 1831 for foreign nationals who wanted to serve in the French armed forces, though it was also open to French nationals, who make up one-fourth of the ranks today. The purpose of the Legion was to remove disruptive elements from society and put them to use fighting the enemies of France. 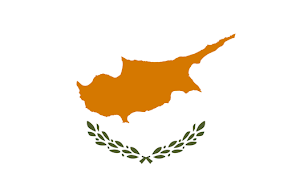 Today it is an elite military unit with specialized training.